Colinas… Where did it Start? So, who or what is Colinas? Colinas is an acronym. It is an acronym for a home… a partnership… a combination of our two names. It means ‘Hills’ in Spanish, which is indicative of our approximate location in Sydney. Our garden is also a fusion, just like the name - a fusion of our cultural and national backgrounds… one born in Malaysia, who loves the sweetness of tropical fruits and the intoxicating perfumes of celebrated Asian flowers, trees and shrubs… the other born in Australia, with a similar love for the same Asian flora, but with a consideration for the local wildlife. These, then, became the themes of the garden: a productive and self-supporting Asian garden, which can sustain and attract the local insects, birds and reptiles. In fact, during the planning phase for the garden, we referred to it as our future ‘hutan’ or jungle. Over the years, we have had many curious, surprising, even astonishing moments in the garden. Often, events in the garden will take one back to the very beginning… thoughts of ‘Where did it really begin?’ So, where did it start for us? For her, it began with beautiful flowers. For me, it started with a chilli plant! The better half has lived in Sydney since 2001. She was inspired by her mother: Mama created a tropical garden, luxuriant with herbs and fruit trees, all with varying leaf forms. From this green oasis in Muar, her Nyonya grandmother would utilise the abundance of the garden to create her unique Peranakan dishes. Ah Mah also tended a patch of annual flowers which she used as decorations for her traditional hair bun. As a teenager, she, the better half, was introduced to gardening by Ah Mah, casting these annual seeds on to the soil, waiting patiently for them to sprout, grow and bloom. She carried these teenage skills to the United Kingdom, where she raised a lovely indoor garden - a spider plant, a miniature syngonium, an English ivy plant and a potted monstera deliciosa - in her Nurses’ Home room. Moving out into her own home, she was able to expand her garden and hone her gardening skills. Without a doubt, her favourites were the tall, flowering plants suited to the English climate like roses, hollyhocks and foxgloves, the floral influence of her Ah Mah still prevailing. The Malaysian, Chinese and other Asian flowers, the floral and scented highlights in the Colinas garden, have their roots in Muar, Malaysia. I can blame my Dad for my love of gardening. Among his many home-grown flowers and veggies, he grew a Cayenne chilli plant. You know, it was one of the few varieties of chilli which could be purchased in Sydney all those years ago. I loved the profuse glossy fruit, first green, then gradually changing to red. Every pendant fruit had its own size and shape. Fascinating! For me, it was prettier than flowers. And it ‘flowered’ all summer and autumn too! As a kid fifty years ago, Mum and Dad would wake me early and abruptly, ‘dragging’ me to the Flemington Markets, not necessarily kicking-and-screaming, but the dawn-awakenings were a trial. Mum and Dad would shop for bulk fruit in those old wooden crates… apples, oranges, nectarines, peaches, mangoes… The fruit would not last long with a family of hungry human fruit-bats, and Dad would recycle the timber into nests for his beloved budgies and finches. I loved the markets, but not those early mornings. Inadvertently, however, I was being taught rich lessons in nutrition, recycling and care for nature. One of those days, Dad took me to the markets via the flower market. I was captivated… I had never seen anything like it. 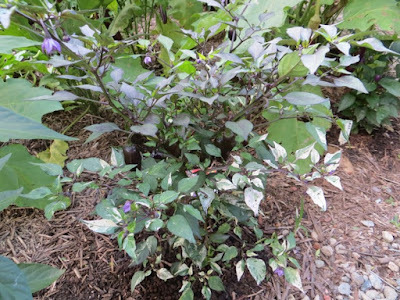 A chilli plant with three-coloured variegated leaves and purple fruit! This became my first plant and the start of my gardening adventure… The winter frosts might have killed my first beautiful chilli plant, but I was hooked. Gardening had been firmly implanted as one of my interests from that very moment. Chilli plants were part of my family’s arsenal in the south. My three boys even catalogued our forty-odd varieties of chilli, collecting the seed, naming ‘new’ varieties and storing them in brown-paper bags over the frosty winters. The chillies had become a family tradition, which continues in the Colinas home garden. I have been back in the temperate, summer-rainfall climate of Sydney since 2010, after spending more than 30 years in the Mediterranean climate of southern New South Wales. During a number of those 30 plus years, I would struggle to ‘resuscitate’ the garden during relentless, parching, baking summers. Even in those times, I loved all things sub-tropical. However, the aspiration to plan and plant a green paradise had to be set aside… this, certainly, was not the environment for the colour, scent and flavour of the tropics.